Saje (pronounced like Sage, but with a "j") is an 8 year old, 120# huggable smoochable pibble and a very wonderful, handsome loving funny pit bull. He loves life to the fullest and has a life that all pit bulls deserve. 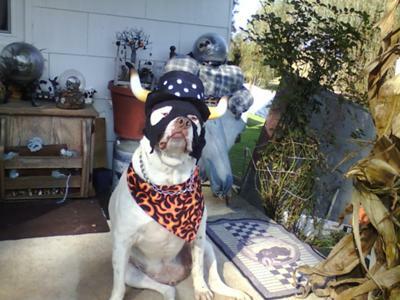 Saje lives on a very large farm with his owners (Mommy and Daddy) and loves to dress up. 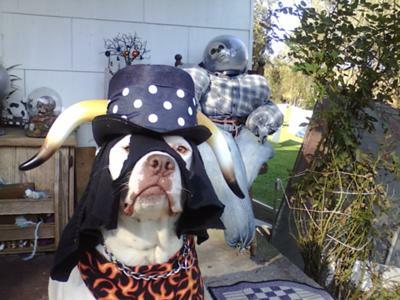 The bullish costume, made of a gent's top hat with bull horns and a mask to keep you guessing who he is behind the mask. The idea behind the costume just fit him with his looks. I liked making this costume for Saje because it just was him. And he looks great in anything you dress him up as or in. My Saje should be the winner because he is such a wonderful pit bull that gives unconditional love to the fullest and will do anything you ask of him. And he has a Mom and Dad that love him more than anything in the whole world and would do anything for him. We would take a million more just like Saje. 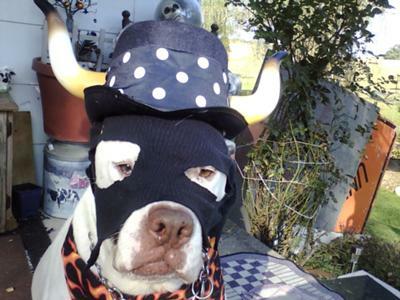 He dressed like he is the dog of Zorro. He is cute in the costume. This dog is really so cute and many people kept the pets in house. Now a day’s school provides the multimedia education. Mostly parents prefer to this education. This site is http://www.top-writers-reviews.com/a-writer-com-review/ very fast about studies because all new notes available daily. Some students save the lectures in mobile phone and when need the lectures then easily play the lectures recoding and video. He looks so content in his costume!